GB3 Energy Smart Homes provides comprehensive residential insulation services in Denver. After conducting an energy audit or an insulation assessment of your Denver home, GB3 offers insulation solutions for attics, crawlspaces, garage ceilings, exterior walls, unfinished basements, and cantilevers. In the Denver market, GB3 uses a variety of products, including cellulose insulation and fiberglass insulation. We can craft the right insulation approach for your Denver home. The number one priority in Denver is usually the attic. Because your attic is at the top of your home; and hot air rises; you lose a lot of heat and comfort out your attic if insulation levels are too low. 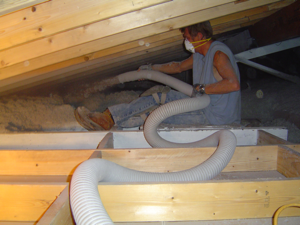 GB3 uses cellulose insulation for flat attics in Denver. Prior to installing cellulose, we air seal between the home and attic to reduce air flow. Crawlspaces can be a major hindrance to building performance in Denver. GB3’s approach to improving crawlspaces in Denver is to install formaldehyde-free fiberglass insulation on the crawlspace walls, put a vapor barrier over dirt, and seal crawlspace vents. Many Denver homes are older and do not have adequate insulation in exterior walls, cantilever floors or in garage ceilings with living space above. GB3 can assess these problem spots in your Denver home and install the appropriate insulation to solve the problem.